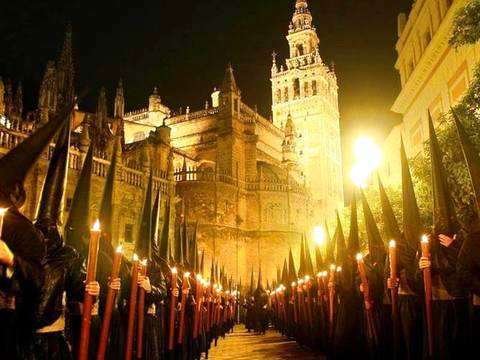 Get a unique perspective on the main places of Seville, by taking this tour at night. 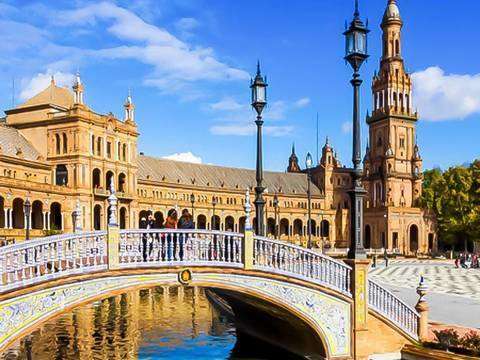 Let your guide take you from the starting point in Plaza de España, which mixes Renaissance and Moorish architectural elements (Neo-Mudéjar); and enjoy the beauty of the Rectory of the University of Seville. 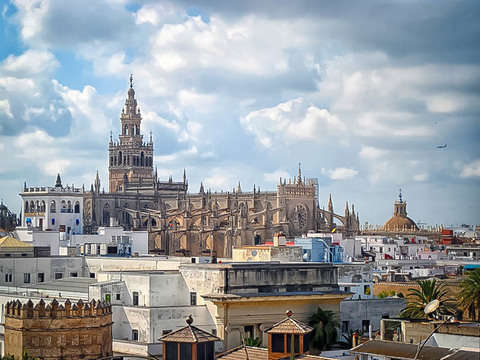 You can also see the Jardines de Murillo, the Barrio de Santa Cruz, Patio de Banderas and the Real Alcazar of Seville, where you will make a panoramic visit of the place while you listen to its history. This building is one of the most representative of the city, the country and the Mediterranean culture. 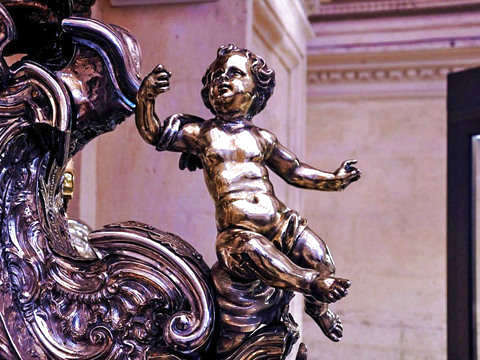 After the Alcázar, you will go through the Archivo de Indias and you will arrive at the Cathedral of Seville. Do not miss the opportunity to take pictures of the exterior as the night passes; the view will be incomparable. 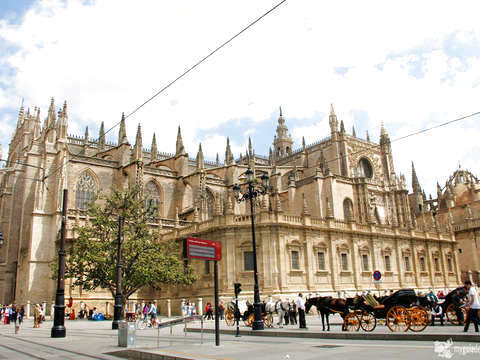 The Cathedral of Seville is the largest Gothic building, and the third largest church in the world. It was registered in 1987 by UNESCO as part of the World Heritage Site. This site houses the largest and richest altar in the world. 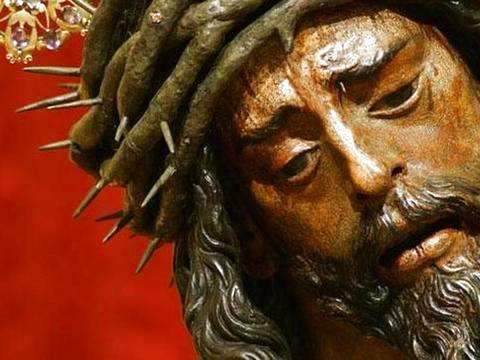 There, you will visit the Giralda tower, which now functions as a bell tower for the church. After seeing the beauties that surround the historic center of Seville, we will take you to Casa de la Guitarra, the most popular place to see a flamenco show with live music. Statue of Aníbal González right in the center of the Plaza de España. Departures Tuesday, Thursday, Friday and Saturday. It is recommended to always be 10 min. before at the starting point. Starting point in Plaza de España. Enjoy the beauty of the Rectory of the University of Seville. 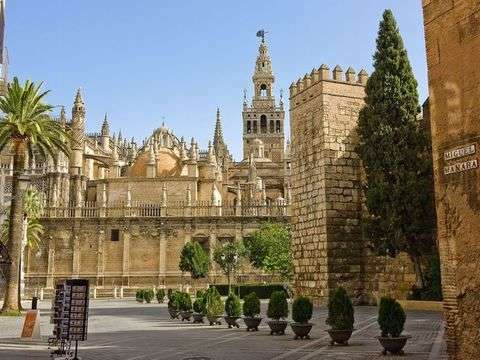 Later, you will see the Murillo Gardens, the Santa Cruz Neighborhood, Patio de Banderas and the Real Alcazar of Seville, where you will make a panoramic visit of the place while listening to its history. 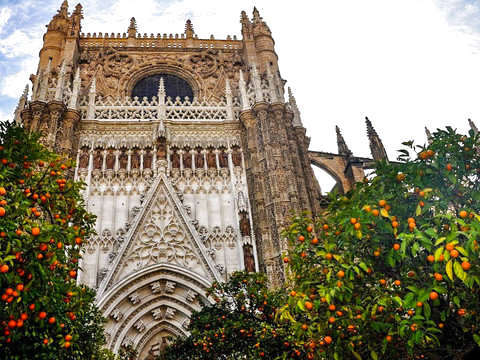 After the Alcázar, you will go through the Archivo de Indias and you will arrive at the Cathedral of Seville. There, you will visit the Giralda tower, which now functions as a bell tower for the church. Finally we will take you to Casa de la Guitarra, the most popular place to see a flamenco show with live music. Access to the House of the Guitar.